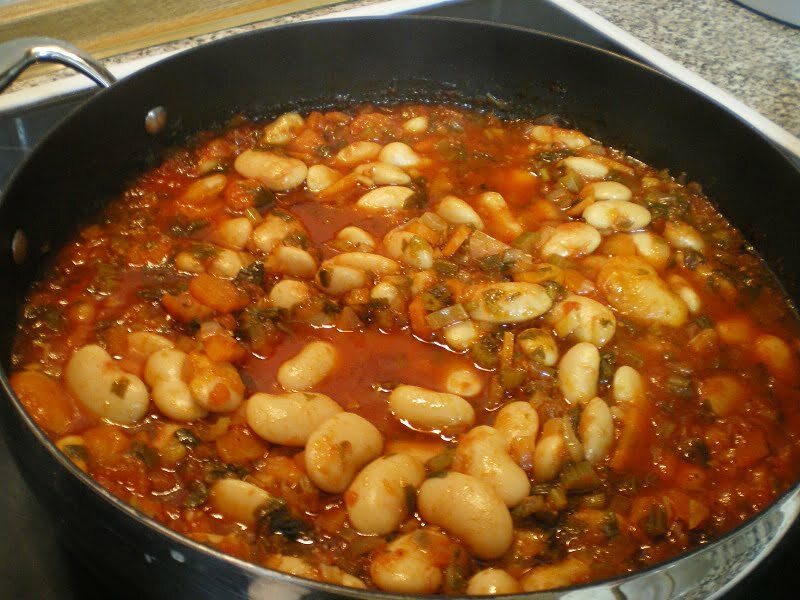 Gigantes plaki is a deliciously hearty vegetarian dish made with giant beans, baked in a delicious tomato sauce until the beans absorb all the juices and flavour. I feel embarrassed that I have never posted this dish before. Although this is a staple dish in all Greek households and I cook it very often, I have somehow forgotten to post about it. Fassolia (phaseolus lunatus) gigantes, meaning “giant” are similar to elephant beans, lima beans or butter beans, but if you can find Greek beans from Kozani they are the best Greek variety. This vegetarian dish is baked in a delicious tomato sauce until the beans absorb all the juices and flavour. It can be cooked in advanced and it only improves with time. Leftovers can be served as an appetizer. The traditional way of cooking them in Greece are in deep, round, fired clay or earthenware casserole pots, called gastra. However, they can also be cooked in any casserole dish, a sauting pan with a lid suitable for the oven, a Dutch oven, a crock-pot or even in a baking tin covered with aluminium foil. If you ever visit Greece, this is a dish you should not miss as you can easily find it in most restaurants. When I found out about the event Kopiaste to AWED: Greek, hosted by Experiments, Emotions, Experiences with food, and created by DK of Chef in You, I took a look at the recipes I have not posted yet and I thought this is the most characteristic Greek dish I could participate at this event. Soak the beans in plenty of water, overnight. Drain and put them in a pot with fresh water and bring to a boil. Remove any froth forming on top, with a slotted ladle. Drain them again and add fresh water as well as the bay leaves and bring to a boil. Add salt, lower heat and simmer until almost cooked (about 1 hour and 30 minutes). Drain and discard the bay leaves. Put the beans in a Dutch oven or a Pyrex. Preheat the oven to 200o C / 400o F.
Meantime, heat the olive oil in a sautéing pan and sauté onions and garlic until translucent. Add the chopped celery, carrots, potato, fresh oregano and beans and mix. Add wine and cook for a few minutes, then add the honey, tomato, salt and pepper and water and mix. Simmer for 5 minutes. Pour the sauce over the beans and cover with the lid. If using a Pyrex, cover with aluminium foil. Bake for about 1 hour and 30 minutes or until the beans are soft and the sauce is thick, mixing once, after an hour has passed. Remove from the oven and mix in the parsley. This meal is so good looking! I would love to sit in front of that plate and gobble your disg greedily! I will have to try your recipe. I've never used wine or honey in my gigantes. I'm sure it's wonderful! Aren’t gigantes just the best? I love the way you have served them with olives and pickled peppers! This is my favourite kind of Greek eating. Simple and uncomplicated. Thank you for sharing Ivy! I love this kind of dishes! This is truly comfort food!!!! !I love, love beans. Better late than never..the gigantes have made hungry desoite having just ate breakfast. wow.. looks really fantastic.. thxs for sharing..
Giganrtes plaki is one of my favorite dishes. I really love the flavors especially when I add big slices of horiatiko loukaniko in. Hearty Thanks for the hearty and authentic dish..It looks perfect. The bean dish looks very comforting! I'm looking forward to trying this delicious dish! My daughter will definitely like this! Ooooh, I want to try this! Beans and tomatoes, two of my favorites! Hope you’re having a lovely day, Ivy! i love beans and more if they are giant !! This has to be one of my favourite Greek dishes and maybe one of the first I learnt from my Mother in Law. I can never say no to a good plate of gigantes! Je n'ai encore jamais cuisiné de haricots géants. Le plat de haricots blancs est pour moi le plat de l'hiver par excellence et celui de la convivialité. Ivy, thanks for making this meal to show us. I know that I would never get tired of eat this. I agree with Peter, simple uncomplicated example of excellent Greek food! Love that dish even though i have never tasted it; love the addition of honey and oregano to it! Yum! This looks so hearty and flavorful! A super comfort meal! I really need to look for this kind of beans: they look so appetizing. Plus, I have never baked beans, and I think it's time I tried. Such an inviting presentation! i love your way to make beans,ivy!delicious and full of flavours! Another perfect dish. I haven't had Gigantes for a while, but now I have a craving. What a tasty meal! I just recently tried a baked gigantes dish and really enjoyed it. Where can I find these beans to plant in Palo Alto, CA.? They really are delicious and I would love to grow them. Unfortunately, I cannot help you.